Welcome to the Official website of Lucky Patcher app. You can download the latest version of Lucky Patcher apk from here for free. Lucky Patcher is a free Android app that can mod many apps and Games, Block ads, remove unwanted system apps, backup apps before and after modifying, Move apps to SD card, remove license verification from paid apps and games etc. To enjoy all these features download lucky patcher apk for free now! Lucky Patcher is not a Malware, Virus or harmful app but Google may show you a warning. 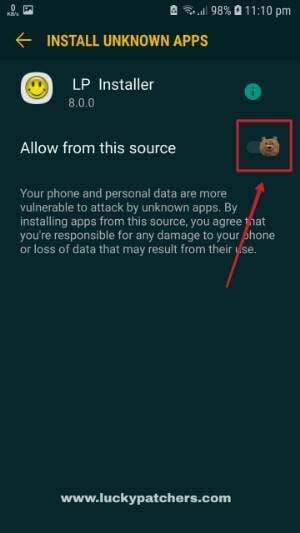 Disable “Play Protect” on Play Store to hide this warning. Many websites and pages share fake lucky patcher app. So, only share this page link on your blog or YouTube Videos. This is the Official site of Lucky Patcher app and you will always get original version from here. Many users face problems to Install Lucky Patcher app. So, we’ve created an Installer app to Install Lucky Patcher easily. We built this installer app to Install the main lucky patcher app easily. See how to download and install Lucky Patcher successfully. If you want to download Lucky Patcher old versions click here. Our developer also created modded Play Store app to bypass license verification check. If you want to download Modded Play store app click on the button below. Make sure you have a rooted device to install modded Play Store. We have created a directory to find the recently added custom patches on Lucky Patcher. Many developers created and submitted this custom patches for you guys!!! So, check the Custom patches from the button below. 1. Open Lucky Patcher Installer. 2. 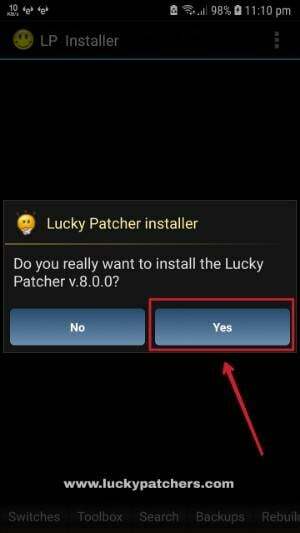 You will find the following dialog “Do you really want to install the Lucky Patcher v8.0.0?”. You have to click on the “Yes” button. 3. 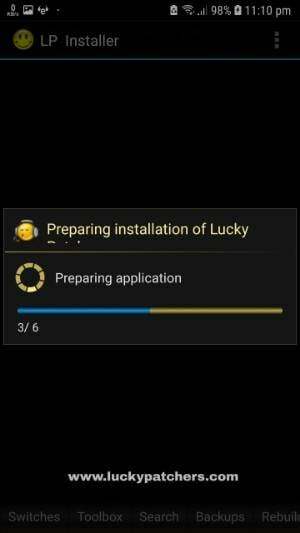 Now the Installer will prepare all the required files and components to Install the Original Lucky Patcher app on your device. 4. If you see this wizard, you have to allow install unknown apps from this source. Click on “Settings” and switch on “Allow from this Source”. Now go to “Settings” and click on the toggle to allow from this source. 5. Now you can find the Install button. Just Click on the install button and wait a few moments until it’s done. 6. Congratulations!! You have successfully Installed the lucky patcher app. 7. 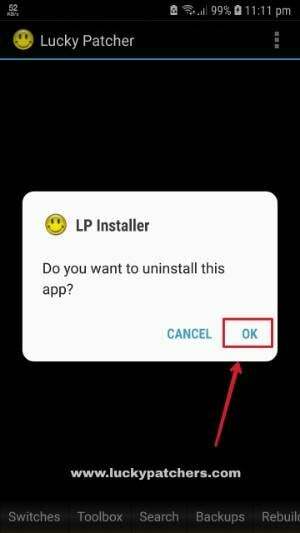 Now Open Lucky Patcher app and click on “OK” to Uninstall “LP Installer” app. For more see details on how to install Lucky Patcher app. # Open Play Store, In menu click on “Play Protect” option. # Now Switch Off “Scan device For Security Threats’ by clicking on the toggle. # Now confirm it by pressing “OK” Button. # Now try again to install Lucky Patcher. Hopefully You have successfully installed it. 1. Remove or block ads on Android apps and games. You can easily block ads with lucky patcher. 3. Crack many games easily with Lucky Patcher APK. Get free coins and gems on many games. It may required root access. By using this app you can remove ads that makes you annoyed during using any app or playing your favorite game. Sometimes those ads make you so annoyed that you lose the interest to play the game or use the app. Ads on header banner and pop up ads are more frustrating. You can remove those ads by clicking few buttons. This apps give you freedom from ads mess. Just download lucky patcher app on your Android and get freedom from ads prison. This apps will give you opportunity to get unlimited coins, money, gems, characters, weapons that you need to buy to use. No need to Waste your valuable money fo the greedy games developers, Within a few clicks you will get the opportunity to get what you want! You are interested to use some paid apps that needs money to buy. No need spend that money, just install lucky patcher app in your android device and you will be able to use many paid apps for free! You will be able to access paid apps features. That will save your lots of money! Buy a coffee with that money and relax with lucky patcher and do some clicks to unlock paid features. Lucky patcher will bypass the google billing page from the users. In this way user will be able to purchase paid apps for free. Our app developer also release a modified play store app to bypass license verification of many android apps and games. You have some favorite apps that you want to convert as system apps. Don’t worry lucky patcher will give you that opportunity to convert any non-system apps to system app. It will provide you copy of that apps in your system folder. Some apps are installed in your phone storage but you need to move them to SD Card. In this case many apps are not allowed to move it to SD card. But lucky patcher will give you that feature to move it to your SD card. Just for few of clicks you can move them to SD card. It’s an easy to use app. The app shows which app has Google ads on it or which one has a custom patch for modification. Lucky Patcher is an advanced tools for Android. So, you need to be sure about app requirements. When your device will meet the requirements to install you will get the perfect feature and best results of this app. 1. Modifying on system settings. Why This App Is Not In Google Play Store? This tool allows android user to bypass in-app purchase and remove ads that makes app developers less profitable. On the other hand it is also a cracking tool. So, the app is not available on Play Store. But don’t worry you can download it from our official website. Note: You should only Download the apk from official website for keeping your device safe from malware or virus. If you are using Lucky patcher from unofficial website use it with your own risk! Here is a small tutorial on how to use the app. You will be able remove license verification, block ads, change app permissions etc with that tutorial. For removing license verification, maximum stability of the application needs to be ensured for every small part of the template. Internet connection need to make this process faster otherwise the process will be low quality and slower, sometimes it could be failed. Try to use all template for attempting to remove license checking. When applicant is in offline apps is being unstable. Restarting apps is making disabling what screen orientation can help. Try to remove license with different method like automatic, automatic inverse, extreme if they are not working there please ty manual mode. It will scan the app and where license verification object will get found then you can patch them with yourself. First make a backup for your apps then choose the “Patch” option then you need to launch this by using “Launch” button. First make a backup using the button on the top of screen. please chose first object “patch” option, after that launch it by clicking “Launch” button. if you still facing license verification problem. Just go back and click “restore” option and move on to the second object. after finding the application and click “fix changes” you need to save is as “save as a custom patch”. enjoy it but you need to know that when the application is being update this patch may not work. For removing license verification chose template and apply this. Support patch for InApp and LVL emulation:InApp emulation is Ad supported and it can switch on the toggle menu. For trying to remove apps permission should be more careful because it an unstable method, it edits system file packages.xml. sometimes this method can make undesirable consequences. You must take a backup of system before try this. In this method will working for system application or “Disable .APK Signature Verification” patch if it is applied to android. it will not change application signature. This method will remove permission by rebuilding App with your desire change. Change Permissions and Activities Rebuild and Install – It is nearly same as safe method, the difference between safe method is it is removing original signature and assign a new signature. If it is checking signature this method will not work properly. Remove ODEX with Changes – For restoring apps original status please remove with remove ODX option. it will undo the change and it will make it previous status. Patch on Reboot – Now this service is not necessary to use, in new version it is doing with ODEX of the application what is not change in reboot. When custom patched changed this option is working that time as “.so” library of the application, which will describe for the patch. Share this App – You can share this app with taking a backup. Copy Changes to dalvik-cache – By default all change is in ODEX file. If ODEX file does not working for app please do it copying to the dalvik-cache. you have to reinstall the app to restoring it. Backup APK file for reinstall – You can copy apk file to SD card with Lucky Patcher from Data Folder. By Lucky Patcher you can reinstall (restore) application. Delete dalvik-cache – dalvik-cache of any apps will be deleted from saved place when ODEX file is created. You need to reinstall the app when the app is not working with ODEX. 4. Unfortunately, if the ads still in there please select “Disable Ads Activities” for will find the ads activities and there you will have opportunity to disable them. Second- In the bottom portion of Lucky Patcher “Tools”->”Patches Android”, you will find (Signature Verification is always true) tab to apply. It will be marked 2/2 applied when it will be reboot (If don’t you want to do you can skip it but we recommend you to do it). If this processes failed you can try Xposed Lucky Patcher module. Third- Please Run Lucky Patcher when internet connection is on and select lower panel “Tools”->”Install the modified Google Play”, select the correct version and install. Switching “Proxy Server” for Google Play is necessary for first patch Android. When you are going to first patch you need to switch on proxy server. After that all your purchase will be redirected to the Lucky Patcher. – When your Proxy Server will be turn off your Kept Purchase opportunity will be turn of too. 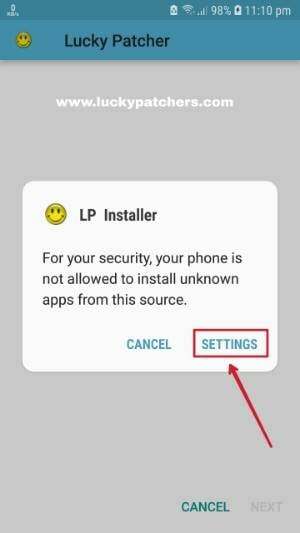 In xposed module a fourth option is for supporting Iapp and LVL emulation while you are not installed modded Google Play Store. Otherwise first and four option you can make in App Purchase. In Fifth option for hiding Lucky Patcher from the application when it Grumbles. – Xposed module has lots of bug when it is updating, when xposed framework will be switched of total system need to restart some times phone need to restart to work it. This application will target for InApp and LVL to the application and more effective. When this operation will finished all purchase will GP to Lucky Patcher. Google Play user patch will be support InApp and LVL emulation(Support.InApp.LVL.com.android.vending) will allow user to bypass purchase process. Emulation only in application working when they will patched it. For doing this application target patch is supporting for InApp and LVL emulation. Please delete the original application (is there any folder rename back the folder). You can try to buy if miracles works on you, Sometimes is happens. Please do the switch on “Mirror of original InApp of service for emulation of purchases”. In This method you can modify old applications or older version of applications. Example of this method used in CreeHack. If you want to try this for latest apps it can support for InApp and LVL emulation, it will not work. Some application could be crush for using this method. 1. Send Response unsigned: For older games and application user no need to have root privileges, where the authors do not inadvertently check the signature data. This option will send a blank signature this will purchase will get virtual activate application and confirm correct signature. Root Privileges users better to avoid this method. 2. Save to restore purchases: In this option Lucky Patcher saved purchase in the database of Lucky Patcher for jailbroken apps. In this option user need to patch after rebooting again. 3. Auto Purchase with current setting: Lucky patcher will auto purchase the same purchase apps. No need to press agree to buy for buying gold or coin. “Delete selected saved purchase” long press will auto purchase gold. Red: No Chance to be register. This application may have two parts (Application and APK-Pro-key) in this case please patch both parts, not either one of them. Orange: This application is a system application. Need to be careful for any damage can be damage application or operating system. ~ Proxy server for new Google Play fixed. ~ Fix auto update bug.